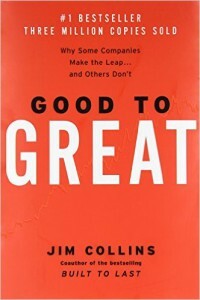 Strategy Book Review: Good To Great by Jim Collins - Why Read This? If there is one strategy book you MUST read this is it…then follow that with Great by Choice. This book addresses a single question: can a good company become a great company, and if so, how? Step by step, this will take you through the elements of strategy, people and execution needed to move your business forward. The well known and successful hedgehog concept is introduced – by its very nature, a hedgehog is a dull creature…simple, lumbering. A fox, by contrast, is cunning, clever, and poking its nose everywhere. Great companies are like hedgehogs, Collins found: they discover what they can do best, and they stick to it. To unlock your inner hedgehog, you need to answer three critical questions: What can I do best? What makes money? What ignites my passion? Then find the common ground to all three answers, and embrace it – that’s the hedgehog. The strategy is so simple that it verges on feeling ridiculously over-simplified…but it works. Get this book, read it, understand it and success will be yours. Based on years of research, it’s a fascinating read packed full of punch.